Confessions of a Single Parent Pessimist: CBeebies' Kazoops Have Released An Album! CBeebies' Kazoops Have Released An Album! A brand new music album by the CBeebies popular TV programme, Kazoops, is released this week and Chunk got to listen to the tracks! Kazoops is a programme based around Monty, a six-year-old boy and his best friend Jimmy Jones, the family pet pig. They challenge life's big and small questions using their imaginations. This involves travelling to make-believe worlds to answer questions such as: 'Do all games need rules?'. 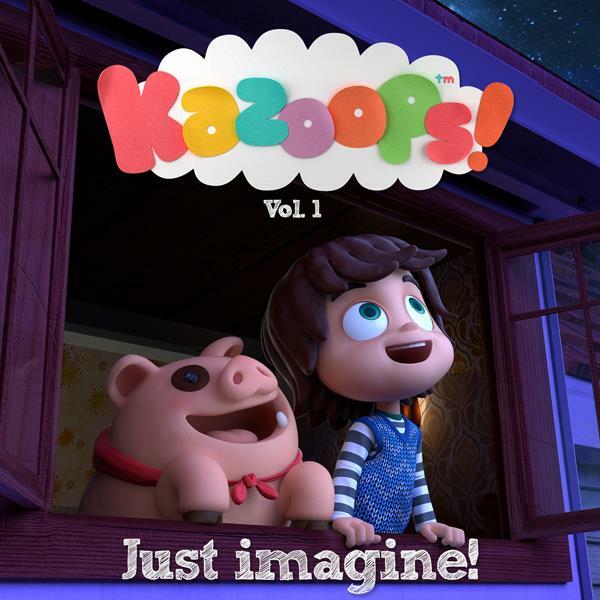 Just Imagine- Volume 1 features 20 songs from various episodes of Kazoops and unlike a lot of children's songs the music is adult-ears friendly too. I know I'm not alone in thinking that a lot of kids songs are repetitive and have irritating beats to the point where they stick in your head for days. Thankfully this album does not make my ears bleed. The album features various instruments from guitars, ukeleles, drums, glockenspiels, retro synths to string vocals. Each music video shows one of Monty and Jimmy Jones' adventures so it engages children visually too. Chunk's favourite tune from the album was Dino Saurus Games, because as you know he's dinosaur-obsessed and the video features a range of dinosaurs having a sports day! The album, by Cheeky Little Media, is available on Amazon, iTunes, Spotify and Pandora, and videos can also be viewed on Youtube. The album will also be released in 18 other languages next year. Check out the tracks and let me know which one is your child's favourite!